Are you considering getting a Cocker Spaniel, and are curious about the breed? Or are you already a proud owner, and simply want to find the best diet for your canine companion? Whatever the case, you can find help in this guide. Cocker Spaniels are a mainstay of American culture. They have consistently been among the most popular breeds for decades, and they deserved every inch of their reputation. What Do I Look for When Buying Dog Food? Lovable, warm, gentle, and energetic, they are the perfect family dogs. This guide will help you find the best food for your Cocker Spaniel. It will also guide you through any potential problems your pet may face, as well as tips for handling those issues as they occur. Taste of the Wild’s High Prairie formula is our food of choice for Cocker Spaniels. It is based on buffalo meat as a main ingredient, and it contains other meats, such as bison, venison, and beef, so it is full of protein to keep your pet as happy and active as they can be. It also contains sources of antioxidants from fruits and vegetables and holds all the vitamins and minerals your furry friend needs, including omega-3 and omega-6 fatty acids to ensure your pet maintains healthy skin and coat. The formula also doesn’t contain any artificial ingredients, colors, or preservatives, and it is free of filler, grain, wheat, or corn, so it should be suitable for your sensitive pups, or dogs with allergies. If your Cocker Spaniel has problems with their digestion or allergies, or you want to be on the safe side and don’t want to expose your pet to potentially harmful ingredients, Merrick’s grain-free recipe is the food your pet will enjoy. Built on deboned beef, it also includes other sources of protein, including lamb and salmon. The formula also contains fruits and vegetables to ensure digestibility. The formula is free of artificial ingredients, colors, or preservatives, so it should help with allergies. It is also free of grain and gluten to help with digestion even if your pet doesn’t have any problems in that regard. It is also full of omega-3 and omega-6 fatty acids to keep your dog’s coat and skin healthy, and it includes glucosamine and chondroitin to help with your pet’s joints and ensure they maintain their mobility. Among a selection of foods for your adult Cocker Spaniel, our choice is Blue Buffalo’s recipe with chicken and brown rice from their Life Protection line of products. This formula is perfectly balanced to give your pet everything they require, and contains enough protein and carbohydrates to meet your dog’s needs. Based on deboned chicken as the primary source of protein, the diet also includes all the vitamins, minerals, and fiber your pet in a well-balanced daily regime. It contains calcium and phosphorous to ensure strong bones and teeth, while also containing glucosamine to help your pet’s mobility by keeping his joints healthy. It’s free of corn, wheat, soy, or poultry by-products, so it is also appropriate for pups with sensitive digestions, while also containing antioxidants rich ingredients, whole grains and foods, and fruits and vegetables to make sure your pooch gets all they need. Owners of more than one dog need a formula appropriate for dogs in different stages of life. 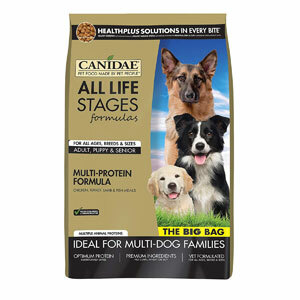 In that category, CANIDAE has their All Life Stages line of products, and their multi-protein recipe is our go-to food. And even if your household has only one dog, this formula eliminates the guesswork of ingredients appropriate to your Cocker Spaniel’s age. This diet is balanced for all stages of life. It is based on chicken, turkey, lamb, and salmon as a source of protein to meet all your dogs’ needs. It also contains loads of vitamins and minerals to meet your dog’s daily requirements, and the addition of probiotics, antioxidants and omega fatty acids ensures your dog will remain healthy in all stages of their life. The formula is free of corn, wheat, or soy, so it should be safe even for more sensitive dogs. 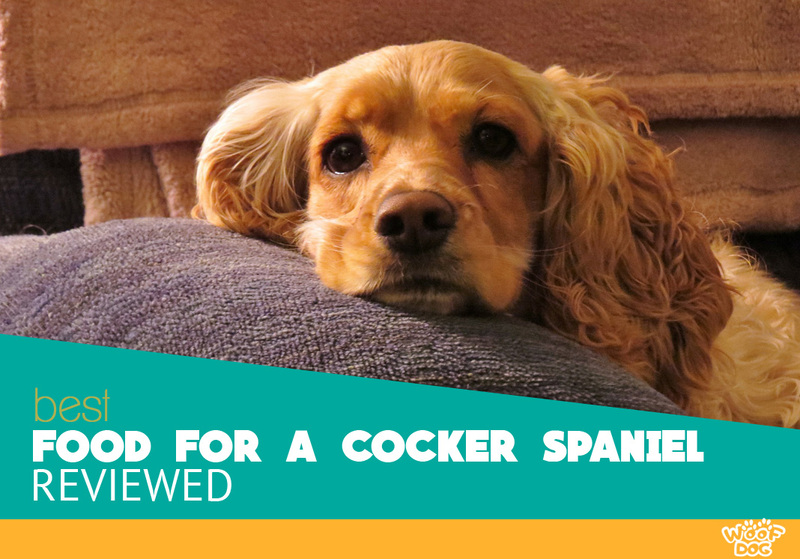 If you’re looking for dry food specifically, or your Cocker Spaniel prefers it over canned food, we highly recommend this Solid Gold’s recipe. It contains all the ingredients to keep your pooch happy in body and spirit. The formula is based on the finest, grass-fed lamb as the source of protein and iron to maintain your dog’s muscle strength. It also contains whole grains to maintain your pet’s health, as well as healthy fats included in olive oil, canola oil, or salmon oil, all to ensure the health of your dog’s coat and skin. It is also free of artificial ingredients, colors, or preservatives and doesn’t contain corn, wheat, or soy, so even dogs with more sensitive digestion, or dogs with allergies, can freely enjoy the unique blend this formula brings. Choosing the right food for your Cocker Spaniel can be daunting, and for that reason, we have prepared a general guide to help that process. This guide is applicable even to other breeds, as our advice is meant to be more universal. As a rule, you should choose a formula containing whole meat as a primary ingredient, as that is the source of the protein for your pooch. Usually, the primary ingredient will be chicken, turkey, lamb, or salmon. In some cases, as in our top pick, the main component can be more unusual, like venison, buffalo, or bison. Meat by-products or meals can also be valuable as secondary ingredients, primarily as a source of additional proteins, but the food you select should have whole meat as a main component. You’ll also want your chosen food to come from a country with high safety and quality-control standards. Essentially, that means you should avoid cheap food manufactured in the third-world, and stick to formulas coming from the United States, Western Europe, or Australia, whichever may be closest to you. You’ll want that primarily to ensure the quality and consistency of the food across different packages. Good safety and quality-control help reduce potentially harmful ingredients, as well. Unless the label clearly states it, you can’t know what the source of meat is, or from what animal. To ensure your pet gets the best food with minimal health risks, avoid those general tags, and look for those with named sources. Additives include anything from fruits and vegetables for all the antioxidants your dog needs, to whole grain to help ease digestion. The food can also contain vitamins and minerals, as well as supplements, such as glucosamine and chondroitin, which help their joints, or omega fatty acids for their coat. You should also pay attention to artificial additives, such as artificial flavors, colors, or preservatives. Where you can, avoid the formulas that contain them to ensure your dog gets the best food, and to minimize the risks of allergic reactions or digestive problems. Cocker Spaniels have been among the most popular breeds for a reason. Their temperament is generally so good that they react badly to harsher training methods. It is because of that temperament they make good family dogs. They are a medium sized breed, and as such, they normally weigh around 25-30 pounds in their adulthood. Their height ranges from 14-16 inches. The females are generally an inch shorter than the males, and American Cocker Spaniels are an inch shorter than their English counterparts. Their color ranges from black, tan, buff, brown, or silver, all the way to multicolored coats. The length of their hairs also varies and may require consistent grooming, so you should keep that in mind if you suffer from allergies. Their lifespan is generally around 10-12 years. Even though most people view Cocker Spaniels as a healthy breed, there are several diseases that affect them more than other dogs. Though this list may seem scary, it merely notes the diseases your pet can develop. As Cocker Spaniels are a long-eared breed, their floppy ears close off the circulation of air from their ear-canals. In doing so, they create the perfect breeding ground for either bacteria or yeast. That’s why ear infections are so common among them. The infections are treated with a topical medication. We also recommend regular cleaning and grooming of the ear hairs to prevent an infection. Even though it is more common in larger breeds, hip dysplasia affects many Cocker Spaniels as well. It is a common genetic canine joint problem. It involves an improper formation of hip joints, which can lead to decreased mobility and a loss of muscle mass. It is treatable either with an operation, or, in less extreme cases, through diet and exercise. The supplements of glucosamine and chondroitin can help with the symptoms, whereas omega-3 fatty acids help with the inflammation. Cocker Spaniels as a breed have a higher chance of developing epilepsy. It can develop as a reaction to something they ate, which you can prevent that by keeping them away from poisonous materials. Epilepsy can also be a genetic disorder, and in that situation, you may need to consult your vet. Treatment for epilepsy has been known to cause weight gain. In that case, you may need to reduce the number of treats you give them, or the foods rich in sodium. Seborrhea is a condition affecting your pooch’s hair and skin, making the hair extra oily, and the skin extra itchy and flaky. If your dog scratches more than usual and you notice those symptoms, you may need to consult your vet to find the primary cause. Furthermore, seborrhea can be a symptom of a deficiency in your dog’s diet, which you can solve by choosing a more balanced diet. As Cocker Spaniels are known to enjoy food, they are especially prone to weight gain. Should that gain continue, however, they can also develop arthritis or hip dysplasia, and in the more serious cases, heart problems, breathing issues, kidney or liver failures, or many others. To prevent that, or to make your overweight Cocker Spaniel loses the extra weight, you can start by giving him less treats on . You can also reduce his weight by choosing a formula with a lower caloric value and making sure he gets enough activity. Luxating patella is, sadly, a common problem among Cocker Spaniels. It means your dog’s kneecap is in an inappropriate position. It is a genetic disease and can only be treated with surgery. Your dog’s life, however, can be easier with a diet rich in glucosamine and chondroitin. If your Cocker Spaniel has a problem with weight gain, general lethargy or hair loss, his thyroid may not be producing enough hormones to ensure the proper function of his metabolism. This disease is hypothyroidism, and there is no cure. Your dog will be on medication for the rest of his life. However, there is a way to ease his symptoms by adjusting his diet. You can put your pet on a low-calorie regime, or you can feed him supplements of omega-3 fatty acids, which should help with his coat. The most common symptom your dog is allergic to an ingredient in his food is itchy skin. If you suspect your dog may be allergic to something in his food, you should consult your vet and find out what, and together with your vet work on a diet that should clear this problem. Typically, your dog could be allergic to a specific protein, such as chicken meat, beef, or lamb. After discovering the offending protein, you should remove it from your pet’s diet. Cocker Spaniels have a higher risk of a genetic disorder affecting their eyes. For example, they can develop cherry eye, which can be surgically corrected. They can also acquire more serious diseases which usually result in blindness, such as glaucoma or cataracts. These diseases typically affect older dogs, but Cocker Spaniels can also develop cataracts between the ages of 1 and 5. Since Cocker Spaniels are known for their enjoyment of food, they are also prone to gaining weight. As we’ve seen, that can lead to other problems. To prevent that, we’ve put together this small guide to help you navigate the occasionally-complex world of dog food. Because Cocker Spaniels were originally bred to be hunting dogs, they require a higher amount of daily activity, and with that, the somewhat higher caloric value of their food. If they, however, don’t get enough exercise, that can lead to weight gain. Generally, that means highly active dogs need upwards of 1.100 calories every day, while inactive cockers can get away with half that amount. You can judge the level of activity your dog gets and adjust the number of calories in their food somewhere between those values. They also need higher amounts of protein to support their active lifestyle and to keep their muscles lean and healthy. They also don’t generally have problems with grain, so unless your dog has problems with allergies, food containing wheat or corn shouldn’t be a problem. Keeping their activity in mind, you can adjust their diet to match their activity levels as they get older, or as they become less active. With that in mind, how many times a day should your Cocker Spaniel eat? Generally, while still a puppy, your Cocker Spaniel should eat about 3-4 times a day. When they reach their adulthood, usually at around twelve months, you can settle on a rhythm of two meals a day. The calorie guidelines we gave earlier apply here as well. If, for example, your adult cocker is moderately active, he needs around 800 calories a day. You can spread those calories across the two meals. So how many cups does that make, and how much goes into each cup? While it varies from formula to formula, you should generally find one that contains around 400 calories in each cup, and then feed your spaniel twice a day with a single cup of food. When choosing the best formula for your Cocker Spaniel, you should make sure all the ingredients match the specific needs and preferences of your dog. Here is a short guide to help you select the best food for your pooch. If your Cocker Spaniel suffers from an allergy to an ingredient in his food, you should change his formula to one that doesn’t have that component. You should consult your vet, however, before making any adjustments, primarily to find out which ingredient bothers your pet. Should you find out your pooch is allergic to chicken, for example, his formula should be free of chicken, chicken meals, and chicken by products. You should also make sure your chosen formula contains omega-3 and omega-6 fatty acids, since Cocker Spaniels are known for their long coats, and those ingredients help maintain them healthy and strong. They are generally found in fatty fish such as salmon, as well as some plant oils, and they also help with any skin and brain problems. 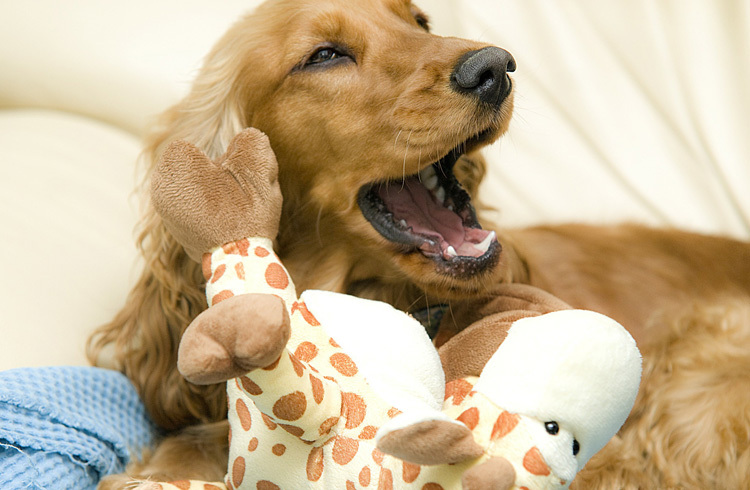 Since Cocker Spaniels are an active breed and can develop problems with their hips or legs, their food should contain glucosamine and chondroitin, ingredients usually found in many modern dog food brands. Those two ingredients should strengthen your pet’s cartilage. That should, in turn, reduce the chances of developing more serious problems as they grow older. Because of that, they are especially important for older dogs, regardless of breed. As we mentioned earlier, the number of calories your Cocker Spaniel needs depends on several factors. Puppies and old dogs generally need fewer calories than adult dogs. Their caloric need also varies with the level of activity your pooch displays. Generally, Cocker Spaniel puppies should need around 400 calories, adults around 800 and seniors around 600 calories a day. Of course, that number varies with the levels of exercise of your pet. Probiotics are the good bacteria found in your dog’s digestive tract. As a food supplement, you should primarily feed them to your dog if he is undergoing antibiotic treatment to help his digestion. You should consider giving your dog probiotic supplements or food rich in probiotics if you notice any problems with their digestion, such as constipation or diarrhea. Other than that, a moderate amount of probiotics in their daily food can help with your dog’s overall health. You can usually find antioxidants in fresh fruits and vegetables, such as carrots, kale, spinach, cranberries, or blueberries. They are a welcome addition to any well-balanced formula, as they primarily help maintain the health of your pet’s immune system. They also help combat free radicals, which should be especially important for old or sick dogs. Apart from foods containing ingredients your dog is allergic to, you should also avoid formulas containing cheap ingredients, unidentifiable meat sources, or artificial additives, such as colors, flavors, or preservatives. You should also avoid food containing soy, wheat, and corn if your dog has digestion problems, and switch those to whole grains like oatmeal or barley. Generally, you should change your dog’s food gradually over 7-10 days to prevent reactions to a sudden transition. You may want to alter his diet if, for example, you are switching from puppy to adult food, or from an adult to a senior formula. To change your dog’s diet, you should start by adding a small dose of new food to his bowl. The next day, you add a little more, while reducing the amount of old food, and so on. After 7-10 days, your dog should eat only the new formula. What Are the Best Homemade Recipes for Puppies? 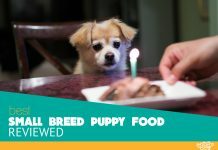 If you don’t trust manufactured foods, or you want to try cooking for your Cocker Spaniel puppy, or you want to save some money, here’s what you need to know. You should start with a protein base, usually whole meat. Puppies generally need more protein, as their body is still developing, so whichever recipe you follow, keep that in mind. You should add essential oils and fats so your puppy has all the ingredients he needs to continue growing. Additionally, as a source of carbohydrates, you can add some whole grains (oatmeal, brown rice, barley, and such). You can add supplements, whether vitamins or minerals, to the mix. Here is an example of a homemade recipe for Cocker Spaniels. 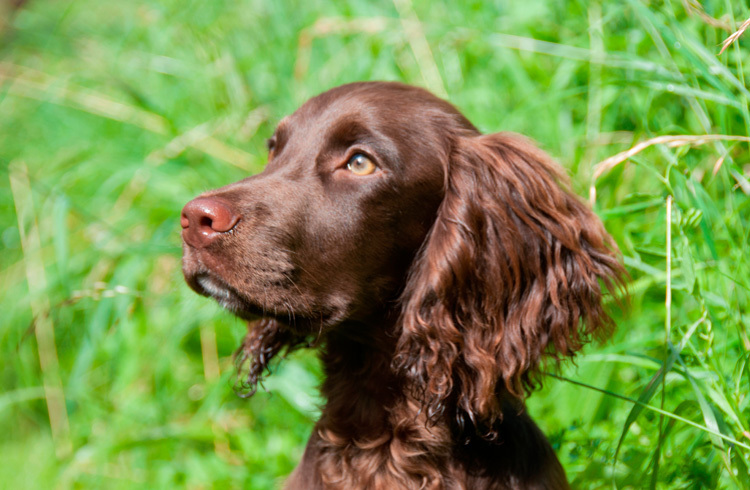 What is The Best Brand For Spaniels With Sensitive Stomach? If your dog reacts negatively to the food he eats, he may have a problem with sensitivities or allergies. Whether those signs include constipation, flatulence, diarrhea, or vomiting, they can be a sign your dog needs a special diet. Our selection of dog food for your Cocker Spaniel includes a category for easier digestibility, and Merrick has been our brand of choice in that group. In any case, you should consult your vet before making any drastic changes to his diet. Is it Safe For Them to Eat Raw Food? A diet consisting of bones and raw food (so-called BARF-diet) is gaining some popularity among dog owners. It usually consists of raw meat, whether beef, lamb, chicken, or turkey, raw fish, vegetables, sources of calcium, and such. It is generally safe, but there can be some side-effects. For more information on advantages and disadvantages, you can check this link. What is a Good Treat Brand? If you’re looking for treats to train your dog with, we highly recommend Zuke’s Mini Naturals. Is it Normal for Them to Be Always Hungry? If your Cocker Spaniel is hungry all the time, there can be a few causes. Even though they are generally a hungry breed, that doesn’t mean they need to eat all the time. It can mean they are not getting enough nutrients from their meals, or that they are bored. Fortunately, you can fix those problems easily—you can give your pet more food or exercise. The hunger can, however, also be a symptom of problems with their thyroid, or they may have a parasite, or, in the worst case, it can be an indication of canine diabetes, especially if they’re also losing weight. In any case, a visit to the vet should reveal if there are biological causes, or if your dog is simply bored. Cocker Spaniels are a lovable breed, what with their big brown eyes and long floppy ears, and with the good-natured temperament to match. Because of all that, they make the perfect pet regardless of whether you live in an apartment or a house, in the city, or in the countryside. They can be a needy breed, though. They need attention and human contact, and they need enough activity. They also need consistent grooming, whether at home or at a professional groomer. Other than that, they may also develop some specific problems of their own. They are, however, among the most popular breeds, and have been for generations, and that popularity is well deserved.